Posted December 11, 2014 by finnfemme & filed under Daily Life, Fashion, Vintage. “You want to knock ’em dead – but not with your breath.” One of the most glamorous Listerine ads ever, from the December 1968 issue of Seventeen magazine. 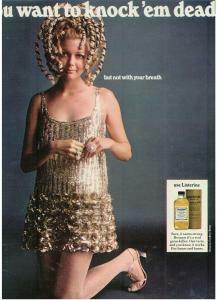 This was back when Listerine still came in only one flavor – the original gold that was (and still is) intensely strong. Listerine’s selling point was that yes, it tastes strong, but that’s because it’s a real germ-killer and it works for hours and hours. To drive home the point, they showcased this mod model in an elaborately gold-sequined mini dress and sprouting gold corkscrews from her hair. 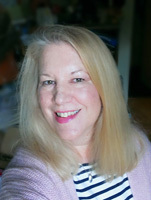 The dress is designed by none other than the fabulous Geoffrey Beene. Listerine and designer dresses may seem an odd juxtaposition in an ad, but it was a perfect example of the incredible marketing of the late 1960s. And the dress is killer!